Ocean’s 8 is a gender-swapped soft reboot of the Steven Soderbergh Ocean’s series this time written and directed by Gary Ross. 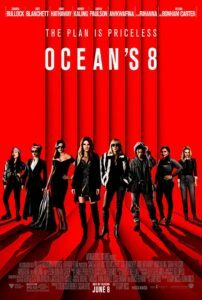 The Eight are led by Sandra Bullock playing Debbie Ocean (sister of George Clooney’s character Danny Ocean) and Cate Blanchett along with a crew made up of Anne Hathaway, Helena Bonham Carter, Mindy Kaling, Sarah Paulson, Rihannna and Awkwafina. From the trailer, the movie looks as though it uses snappy, dry humor. It portrays Debbie convincing Tammy (Paulson) with a funny cut. “I’m out of the business.” “Do you know how much this job is worth, let me tell you…” Cut to Tammy carrying a suitcase past her son. “This is mommy’s special business trip.” Would that it were that snappy. Every piece of the movie felt less exciting than the last. The heist of of a multi-million-dollar necklace from within the Met gala is a clever female twist on the Las Vegas heists of the other films. Part of the job is getting dressed up and going to an extremely chic party full of celebrities. But it spools out slowly and seems to really not take a lot of effort or go wrong for more than a moment before it spools out some more. At it’s worst, I felt like I was sitting still in the Met itself, watching dinner theater happen around me. See how beautiful all of this is? What’s missing in droves is the humor. There’s no friendly rivalry or verbal sparring that the other movies have. Helena Bonham Carter’s Irish Rose Weil is probably the most consistently amusing, but she’s not around often enough to carry the film. It’s not until James Corden shows up in the last minutes of the film that we finally get some comic injection. Ocean’s 8 is a good concept that is let down by a lackluster script and a bloated final cut that sprawls to nearly two hours long. They left themselves enough numbers for a trilogy – maybe Soderbergh could be convinced to come back and give this cast a better workout.